With a shake up for Super Stock that saw it combined with several other classes early in the season, it quickly became one of the most diverse categories in the field. “I like the variety of cars. 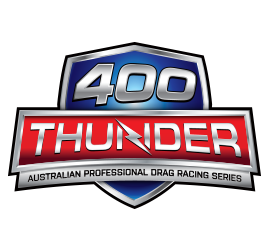 I don’t believe turbo EFI cars should only race turbo EFI cars, as long as there’s parity we should all be able to race together,” begins inaugural 400 Thunder Champion Matt Lisle. With 20-odd years of racing experience up his sleeve and the encyclopaedic knowledge of Phil Laird behind the vehicle, it should come as no surprise that the Nissan-powered RX7 really set the cat amongst the pigeons in Super Stock and anyone who’d seen it race throughout the season knew that the car was capable of coming home with the crown. “Our season started at the East Coast Nationals and, while we lost an engine there, we only had one goal and that was to reset the World Record on a 26-inch tyre and we smashed that,” explains Lisle. “Our original game plan was to go round-to-round, but once we knew we’d been combined in to Super Stock we buckled down and did our research on who we were racing against,” Lisle continues of the practical approach they took to racing. Notoriously hard on parts, Lisle explains that the RX7 was originally a Sport Compact car, which presented them with unique challenges when compared to the rest of the field. “We had to focus on keeping engines alive as they can be fragile, and we’re forever changing parts searching for something stronger and lighter. We’re also on the smallest tyre in the class which limits us with how much power we can put down in the first half of the track. We’re very strong in the top end though,” an attribute that Lisle admitted did a lot of the heavy-lifting throughout the season. One name that kept coming up was Clint George, whose Chevy Cavalier gave Lisle and the RX7 plenty of heat. “We knew Clint had the National Record , in fact we drew him in the first round and it felt a lot like it should have been the finals!” exclaims Lisle. The team would wash George, before bowing out in the Semi Finals with a season-ending crash in the deep end of the track. It would put a dampener on their Winternationals weekend, and meant that the focus was no longer on the Championship. In fact, Lisle and the crew only found out they were 400 Thunder Champions by mistake! “We were at the presentation having a chat to Scott Porter who’d won Factory Xtreme and were surprised to hear our names called out for Super Stock! It made up for the hurt of having a damaged car and lifted everybody’s spirits; by the time we got back to the pits everyone was smiling and high-fiving!” exclaims Lisle. ©2018 400 Thunder All rights reserved.